Rose and Dave created this beautiful playhouse for their granddaughter using a Sanders Copa Cabana. With a single door, windows, Colorsteel® roof, veranda, plus flower pots! The Copa also makes a perfect garden shed for those who love to potter, with it’s compact yet spacious size. Sanders designed and built this custom swimming pool pumphouse and storage shed for a newly built homes backyard in Auckland. Watertight, secure and designed to compliment the house and garden around the pool. This great looking 10sqm Sleepout Cabana was professionally installed in the customers Auckland backyard with a full interior lining package with no consent required. Twin Peaks island style! Check out this double Loft adjoined with decking and shade pergola on Waiheke Island. This super-cute Copa Cabana was installed in Tauranga to be used as a potting, storage and garden shed for our customer. This custom shed was made longer than standard to fit our customers canoes, and sized to fit snugly down the side of their place in Pauanui. Built just in time for Spring, this Deluxe Cabana with decking and a Lean To fitted with a bathroom and additional Colonial window was installed by the team in Leigh. A completed self-contained Deluxe Cabana, with extension for a plumbed bathroom unit professionally installed for our customer in South Auckland. Our customer in Tairua opted for paint-ready weatherboard in place of the usual board and batten cladding so they could add the finishing touches and match to their house. 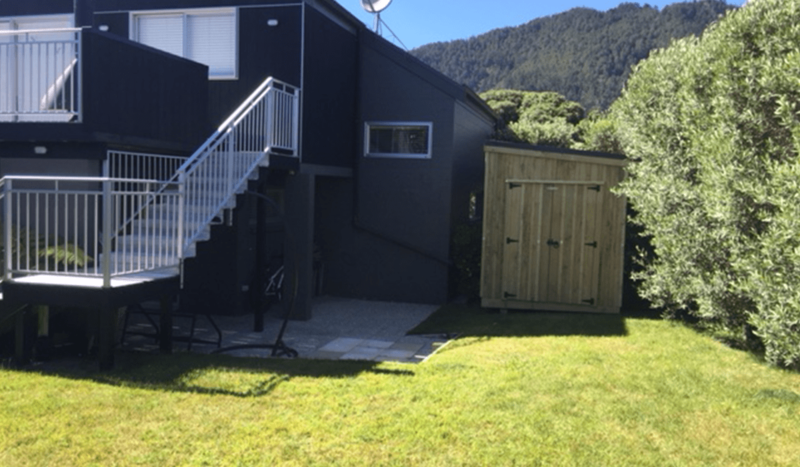 An amazing pair of twin lofts adjoined by decking with kitchen and bathroom units assembled by our installers in Northland for this guest accommodation. This Studio Cabana and Lean To shed were tucked amongst the bush in the corner of this stunning rural property in Whangamata, Coromandel. This guest and worker accommodation was installed in the Kaimai ranges in stunning surroundings, what a view from the top! This Deluxe Cabana with a flat roof was installed on the side of this customers property overlooking the ocean in the beautiful Coromandel town of Pauanui.